A little over a year ago I made the asparagus and gruyere tart for the first time and I was immediately hooked not only to that particular tart but the whole style of tarts. These simple premade pastry tarts are so easy to make and they always taste great! 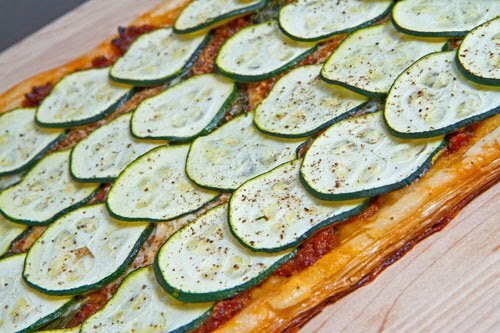 You pretty much just roll out some puff pastry or oil up a few sheets of phyllo dough and then top it off rather like a pizza with sauces, cheeses and vegetables. Despite the fact that the topping options are near endless I have been enjoying highlighting a single in season vegetable like asparagus, tomatoes or zucchini. 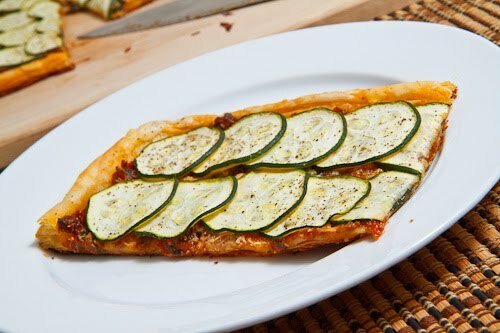 One of my favorites so far has been a zucchini and feta ricotta tart so when I came across a zucchini and sun dried tomato pesto parmesan tart on Cook Sister it made it to my meal plan as soon as the local zucchini was in! In my opinion, you really can’t go wrong with a flavour packed sun dried tomato pesto so I already knew that this tart was going to be a winner. Knowing that the sun dried tomato pesto was going to be key to this dish I set about making my own and homemade pesto is actually rather easy. Although you could mash everything up in a mortar and pestle as is traditional, it is much easier to just throw the ingredients into a food processor and puree them. One of the things that I like so much about making you own pesto is that you can experiment and change up the flavours each time by using different nuts, cheeses or even adding new things like say a splash of balsamic vinegar. With tomato season just around the corner you could even make you own oven dried tomatoes for use in this pesto. Spread the pesto over the center of the dough and top with the parmigiano reggiano and basil. Arrange the zucchini slices in a single layer on top of the pesto and season with salt and pepper. Delish! Definitely a crowd pleaser that I'll have to put back on my menu! Great blog Kevin! Keep the recipes coming! Looks good as usual. But, how 'done' do the zucchini get? I suppose if there's enough oil they will cook. How about a recipe to make one's own 'oven dried' tomato pesto?? cheers. Could you peel, seed, and squeeze ripe tomatoes and make that into the pesto?? that is a beautiful tart!! and I love that pesto you made, so flavorful! That sounds to die for. I know what I'm cooking this weekend. Love this recipe, especially the pesto! Yum! Anonymous: I sliced the zucchini in a mandolin and they cooked to tender in the time it took the pastry to turn golden brown in the oven. You can just replace the sun dried tomatoes in this recipe with oven dried tomatoes. Anonymous: You could certainly use fresh tomatoes to make a pesto but I think that such a pesto might be a bit juicy for use in a tart like this and the flavour would not be as intense. Great tart and pesto. I think, that I would have added some freshly graded Parmesan on top. Now doesn't that look amazing! Definitely going to play with this. Adore sun-dried pesto and the zucchini keeps coming and coming .. and have puff pastry in the freezer… you can see where I am going with this. Thinking of the cheese. A very refined tart! So summery and delicious! Çok leziz ve iştah açıcı görünüyor. Ellerinize,emeğinize sağlık. oh,I really love that pesto! looks so delicious! Dos recetas de una vez. Me encantan los calabacines y estos se ven deliciosos. Y la salsa un aspecto increible. I'm not the biggest puff pastry person but I will definitely be trying this out on a pizza! Love the pesto! Yu-u-um!I too am a fan of a dish where I toss tasty things on frozen pastry. This will go on the steadily growing list of things to do with zucchini! I made the asparagus and gruyere tart and it was an absolute crowd pleaser. I will be sure to try this as I currently am overflowing with zucchini from the CSA. I'm trying to think of a way to make this work sweet too – perhaps with nectarines, white chocolate and honey. That almost looks too good to eat! OMG that looks amazing! I'm gonna have to try that one night. Thanks! I am head over heels in love with your blog. You are the king of puff pastry tarts, Kevin. This sun-dried tomato pesto looks as though it could be very versatile. Hi, Kevin… Yesterday evening, after my first taste of this year's Ontario peaches, I started nosing around online for recipes. I decided to post a hallelujah to peaches on my own blog, and included the first recipe I found that made me drool … It was your peach bread! NUM. Your entire blog makes me drool! Your recipes are so alluring, and I, too, have a closet-sized kitchen — in fact, it's so small that only one person can be in there, comfortably, at a time. But look at what can emerge from such a small space, eh? It looks like a wonderful lunch! Did you take it to work, and make everyone jealous? I love the tomato pesto here. It looks very good! Love the photo! What a great recipe. I love pesto and with sun dried tomatoes, this will fast become a staple around my house! Thanks for sharing! Love the cucumbers on thop! Yum! This looks so delicious! Will be saving this recipe for sure. Mmmm, I am so loving tarts this year too – and this looks like a GREAT combination. Thanks! Your asparagus and gruyere tart was stunning as was Jeanne's zucchini and sun-dried tomato pesto parmesan tart. Yours brings it all home. I guess I better get baking! Beautiful!